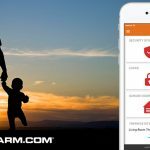 Coastline Security smart home security (powered by Alarm.com) helps you protect and control the entire perimeter of your home – including the garage. 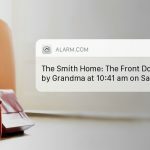 From protecting your car and guarding your tools, to securing a common but easily overlooked entry point to your home, a Smart Home Security system powered by Coastline Security and Alarm.com has you covered. Here’s what it will give you. Around 70% of Kiwis use their garage door as the primary entrance to their home. That’s a lot of opportunity to leave it open by accident. A connected garage door supported by Coastline Security helps eliminate this problem. Using your location as a trigger, our exclusive Geo-Services feature alerts you if you leave home without securing the garage. You’ll get a pop-up smartphone alert that lets you close the door right away, from wherever you are. 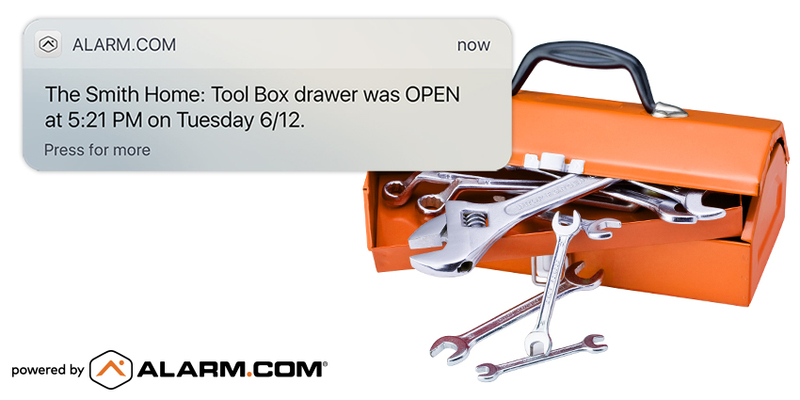 You can also create an alert to tell you if the door is left open for a certain amount of time. From lawnmowers to tools, you probably have thousands of dollars worth of contents in your garage. If you’re a car enthusiast or dedicated DIY-er (must of Kiwis are), multiply that figure by ten. A wireless Smart Home Security system protects your property and is easy to extend into an attached garage. You’ll always know when the garage door is opened, and our exclusive image sensor will detect movement and send you a picture of what caused it. If you add a video camera to your system, you can record a clip automatically every time the door opens. You can view your images and clips anytime, anywhere, from your smartphone (or Apple Watch). Our systems are also professionally monitored in our offices. That means that if there’s a break-in, our trained security professionals will respond accordingly. With power tools and petrol (we’ve all got in in the garage) on hand, your garage is one of the most fire-prone places in your home after the kitchen. A connected smoke detector powered by our smart home security will instantly alert the us in the event of a fire. It’s tempting to leave the door that connects your garage to your home unlocked, especially when you know the garage door is closed behind you. However, this door should be secured day and night as a potential entryway to your home. A smart lock with a keypad is perfect for this role. A simple four-digit code lets you back into the house, eliminating the need to carry your keys around with you. As a bonus, if you have an older teenager who’s started driving, you can give them their own user code which triggers a smartphone alert, letting you know they’re home safe. Interested? Get in touch with us on 07 865 9008 or visit our contact page to send us an email.